Generates two separate signals for driving two servos. Sweep mode for stress testing servos. Input for reading a servo signal (from a receiver). Very high resolution at both input and outputs. 0.1µs (which equals 10,000 steps between 1 and 2 ms). Voltage and current readout. 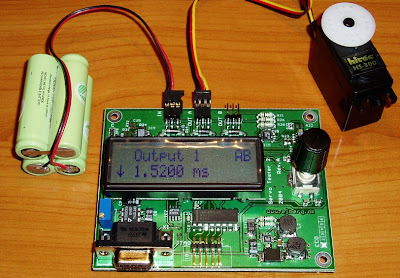 How much current does your servos actually consume? How much does your receiver pack drop under load? Simple user control. Access all features with just a single rotary knob with integrated push button. 2 x 16 character LCD. RS-232 connection. Write your own program (PC or whatever), that can control every feature of the tester. Make sure you have read the license conditions, and that you agree with them, before downloading any files.